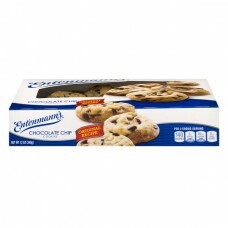 Provider: Bimbo Bakeries USA, Inc.
Entenmann's® Original Recipe Chocolate Chip Cookies. Per 3 cookie serving: 140 Calories. 3g Sat fat, 15% DV. 80mg Sodium, 3% DV. 11g Total sugars. Net Wt 12 oz (340 g). Since 1898 the Entenmann's name has stood for the finest quality in baked goods. Today this tradition remains as Entenmann's continues to deliver delicious favorites! We are committed to providing you with quality products and welcome your Questions and Comments. Call 1-800-984-0989, Consumer Relations Department. When writing, please include the proof-of-purchase (bar code) and stamped date code. For more information Visit us at: www.entenmanns.com. ©All rights reserved.